Last week I needed to get something going on my small Shannock tapestry loom for our Tapestry Group meetings. We meet two times a month. On our next project we are going to focus on very small tapestries; either 3 by 3 or 4 by 4 inches. Color, content and yarn selection are whatever we would like. I have decided I am going to a study in value in an indepth manner. 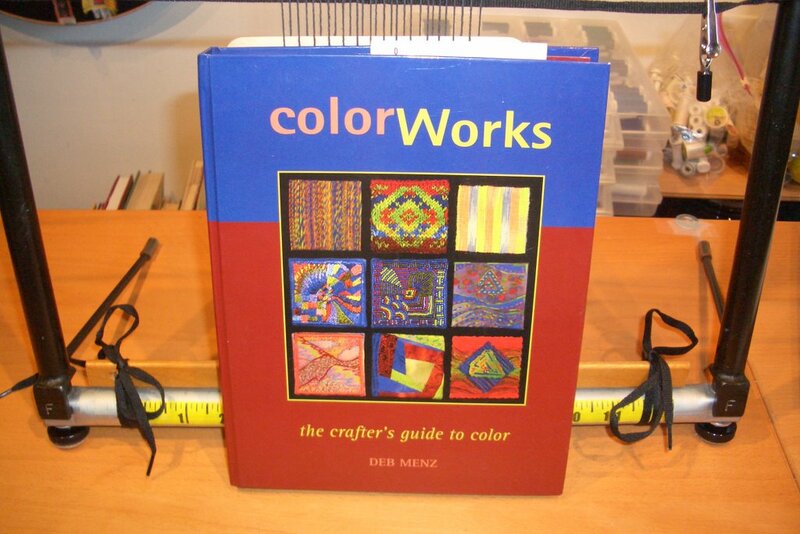 To start, I pulled out one of my favorite books Color Works - the crafter's guide to color by Deb Menz. 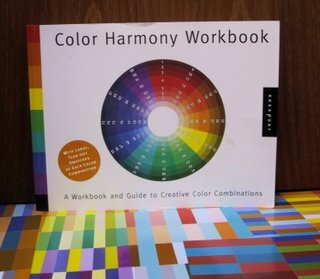 I will be looking at other color theory books also along the way. I have always been intrigued by Color Theory since it discusses color in a practical manner for anyone using fiber, yarn, thread, beads, paper or other medium. Most color books focus on painting when looking at color theory. I have found you just can't mix yarn the same way you mix up paints. Some 'rules' hold true - others do not. The texture, body and content makes yarn a far more complex animal. The author says you should not just read the book but actually apply the concepts in your work. "You can read the book a hundred times, but without hands-on experience -actually working with color - the concepts will not become yours." How true. I have looked through this book so many times since I bought it a couple of years ago. It has the most beautiful photos. That was the reason I bought the book - - and it is an excellent reason to buy the book - if it were a bit bigger - it could be a coffee table book. It's smaller size makes it more of a studio book where it can sit nearby without taking up too much room. The book has sat on my shelf for at least a year, only to be removed now and then so I could marvel at the photos or look up a definition of a color term. I always wondered whether I would ever do anything 'real' with this book. Now is the time. There are two other sections that 'read' well but I have not worked through them to internalize the concepts. There is a section which discusses how to best choose colors and design. There is a section on spinning, knitting, weaving, hand embroidery, bead embroidery, surface design, machine embroidery, quilting and paper collage. Again, it is written in the one page reading - one page of photos format. For example, in the knitting section she discusses how and why she decided which colors to use in each part of the design of a Fair Isle sweater. She also describes which of the tools from the Color Tools chapter that she used to make her selection happen. All the color tools are included in the back. There are two of each tools. One to tear out, and one that stays in the book. There is even a section built into the back cover to hold the tools which are removed. I keep my grayscale there as well as my color cards. A great deal of thought went into both the content and layout of this book. For me I am going to focus on the chapter on value. I plan to work through the concepts by making my own samples in tapestry. My first 'piece' will have at least one sample in each of the seven value keys which she describes. If you want to follow with me, I am journaling the results in our tapestry group's blog, The Weaving Divas. Anyway, I have always liked this book - if only for the pictures. As I start into the planning and execution of this new project on value I can see I may really enjoy using the book, Color Works - the crafter's guide to color as a color theory textbook. If you do any type of fiber work, you should own this book. You could get it out of the library - but why waste your time - just buy it. If you don't use it as a textbook atleast you will spent a lot of time marveling at the pictures. Not much posting last week...computer problems - which I attempted and perhaps succeeded in fixing after many recovery points, re-starts, downloads and scans. On an exciting note, my baleen double point needles arrived so I was able to start knitting up that self-patterning yarn I had dyed. 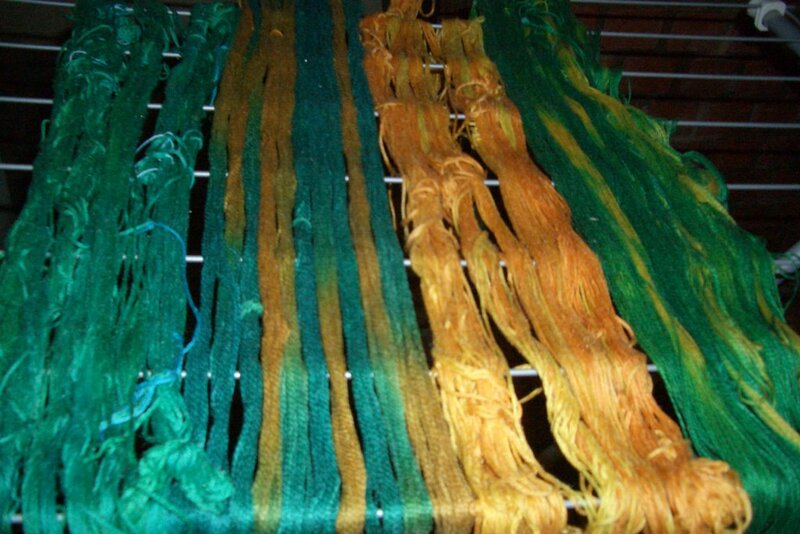 If you recall, our group was planning a dye day to experiment with dyeing our own self-patterning yarns. I did a quick experiment to see how it worked in order to provide tips to others who would be participating. The dye day was rained out and is being rescheduled. But the experimentation did leave me with yarn to knit. 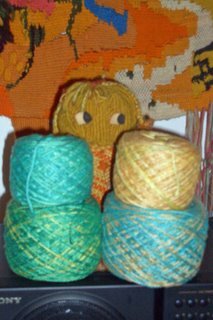 Liking yellow, I started with that ball of yarn. This is the amount if I-cord I was able to finish in one TV sitting. I now feel a bit more like a knitter since I have something that is mindless enough to knit while watching - actually listening to TV. Not too evident from the photo, the colors move from a yellow to a yellow orange every inch to two inches or so. That was the desired pattern. The color shifts are a bit more subtle that I had intended. Next time I will use red instead of orange to get a bigger punch. The green flecks, unintended consequences of a sloppy clean up of earlier skein painting, are visible here and there. I am not sure I like the green spots as a 'design element'. I have two other self-patterned yarn balls to knit that should be a more dramatic shift in colors with a more varied pattern. I always have odd feelings when I finish an artistic piece that I have been working consistently on for a long period of time. There is always that sense of accomplishment and the pleasure of seeing an idea that was in my brain be there visible for all to see. But there is also a sense of disappointment for having no more warp to weave; somewhat like the loss of a good friend. This morning around 7am I finished the last taquete piece with absolutely no room to spare. The warp would not move forward another centimeter. I was able to fit nineteen different permutations of colors and beetles. All told the total length was 12-13 feet. There are a potential 57 bookmarks. Here's a picture of it rolled out on the floor. The green between each piece is a spacer made of thick paper. I cut through the spacers and trimmed off the extra long pieces. Now the weavings are resting pending finishing. I have time to finish them since they are not due until the end of May. I will store each in its own plastic holder so the threads will not catch on anything and I will not be tempted to tweak things. I find I often want to trim the threads exactly here and there which is a waste of time. Each must be trimmed individually during the finishing process so it pays to wait. Also, it avoids any mistaken cuts with those scissors. This careful organization will also make it easier to keep track of which color/beetle combination was used for each piece. Well, that's that. Hmmm...I feel a bit lost...now what should I work on? For the last three bookmarks, I decided to use color palettes from history. The three I chose were 1) Rococo 2) Bakelite and 3) Vermeer. Rococo was an architectural style developed for interiors. It has restrained colors with preferences for natural colors. Accents were brighter colors like crimson, yellow, celadon green and of course gold. The bookmark woven with this color scheme is one of my favorites. I was so excited about it I started the next one without taking a picture. Sorry! The Bakelite palette is from that synthetic plastic patented in 1907. Typical combinations were green on amber or red on cream. When I saw the palette it reminded me of our mah jong set. The tiles were cream with a special green on the top. The symbols were in green and red. As I actually wove the piece, the middle color combination reminded me of the Girl Scouts. The green was like the Girl Scout's dress and the brown was like the color of the Brownie outfits. The picture below does not do justice to the colors used. But I don't have time right now to play around in PhotoShop to make it right. Perhaps later. My last bookmark uses colors from the section titled "The Dutch Home - Through Vermeer's Eyes". This is a subdued palette with the most popular accents of yellow, blue or jade green. The paintings of this period reveal austerity, cleanliness and minimalism. Sounds like it should show well in this last weaving. The weather report indicates rain and thunder expected at ten this morning - exactly when our Dye Day is to commence. Oh well we will dye another day. I did have time to dry and wind the yarn I dyed earlier this week. The next step will be to knit the yarn and see if the pattern comes out the way I had intended. I just got an email indicating the double point needles I ordered are in the mail so I will wait until I get them before going further on this project. Top Right: I will need to use red instead of an orange dye to achieve the effect I had inteneded on the yellow yarn . But this more subtle shift from yellow to yellow-orange might be useful in the sculptural piece I am designing. Bottom Left: The emerald green on the creme yarn is close to what I have in mind but I need a more poppy orange than a lemon yellow. Top Left: I am seeking subtle shifts from blue-green to green-blue from this yarn. It may be too subtle. Bottom Left: I wasn't sure that turquoise was what I had in mind when I initially selected the yarns. Now I am more sure it was not. I will have to see how it knits up...the pattern of color changes might be what I want...but not the color. It does go nicely with the yarn on the top left. Blogger burped yesterday right before I was ready to publish...so this is my second attempt at this entry. I am trying to describe what I learned from my practice run on dyeing self-patterning yarns. Friday, if it is not "raining with thunder" we will be having our real Dye Day. I wanted to try some in a 'controlled' environment to see what issues we might have. This is part 2 of my Homework for Dye Day. The benefit to you of Blogger's burp is that I can now add a picture. Yesterday, I had the skeins of yarn resting for 12+ hours, first thing this morning I rinsed out the yarn to see how they all came out. Here's what it looks like drying before sunrise. I dyed four yarns. The two on the right were yellow at the start and the two on the left were a natural off white color. Two were 3/2 pearl cotton and two were individual balls of the KnitPicks knitting yarn composed of 60% cotton and 40% modal. As you can see, the color took well. I used Createx instead of Procion which we will be using on Friday but the process will be the same. I painted with four colors; emerald green, turquoise, yellow and orange. I have this concept in my brain which is mulling around...I thought these might be the colors I want. I won't discuss the dyeing process since we have done this before. I want to indicate some areas which might be useful to consider for those coming on Friday...or doing this elsewhere in the world. Pattern: This is supposed to be self patterning yarn so one needs a pattern. I decided I wanted to knit some I-cords so I knitted a few inches with various needles to get the look I wanted. I unwound one inch of I-cord and discovered it took about 12 inches of yarn. I got out some graph paper, numbered forty squares to represent the forty feet of the skein of yarn I was to make and simply filled in the squares with a colored pencil in the pattern I wanted to follow. I left blanks where I wanted the yarn undyed. That was my pattern. A pattern is something which is to be followed. In retrospect, I think I only used the pattern in the last two skeins. In the beginning, I just painted what seemed interesting. I really won't know how they will come out until I knit the yarn. But I think I should have used longer patterns of color since the colors seem to wick together much more than I would have expected. Making 40 Ft Skeins: I didn't have any trouble making the skeins. I simply placed two C-clamps in my living room 20 feet apart and wound the yarn around them. I tied [not too tightly] the skeins in 9 places using some left over yarn. Then folded up the skein and tied it with some thick yarn so it would not tangle during the soaking processes. For the KnitPicks yarn I only skeined one ball. For the pearl cotton, I skeined how much I thought would be a similar amount. The helpful hint from the book was not to use more than 60 rounds in any skein. I don't think I even got to 20. Given the mess, time and effort of the process, I think it would be beneficial to go with bigger vs. smaller skeins. I also think it would end up with less tangles. Painting 40 Ft. Skeins: I was outside and used a round table covered with plastic and newspaper. I changed the newspaper between skeins and wiped the excess dye with paper towels. It's messy. There is no doubt about it - messy, messy, messy! Have a trash container close by. Perhaps we should all bring extra newspaper and paper towels. I untied and unfolded the bundled yarn and placed it on the table. Avoid round tables if you can, it's a pain getting the yarn to go around and around without having it touch previous rounds. My table seemed a bit small and dye would dribble over to the next round if I was not careful. I used a magic marker to mark each foot on the newspaper. In this way I could easily follow my pattern from the graph paper when painting. For painting I used a painters sponge roll which was about one inch wide. I did not need to use that much dye, I was surprised. I made sure the dye went through the entire skein from top to bottom. This was not too hard since the skeins were so small. Wrapping the 40 Ft. Skeins: This part seems important to consider both from a result standpoint and an environmental standpoint. I used three methods. I recommend the third. 1. The yarn on the left was painted and put into a ziplock back to rest. As you can see, this method allowed all the dye to blend in with all the other dye so the pattern seems to have disappeared. 2. The yarn next to it used a different technique. I wrapped each 2-3 ft section individually with plastic wrap. This used a lot of plastic wrap and too a great deal of time. It also took some time to remove during the rinsing process. My patience level did not like this method. 3. 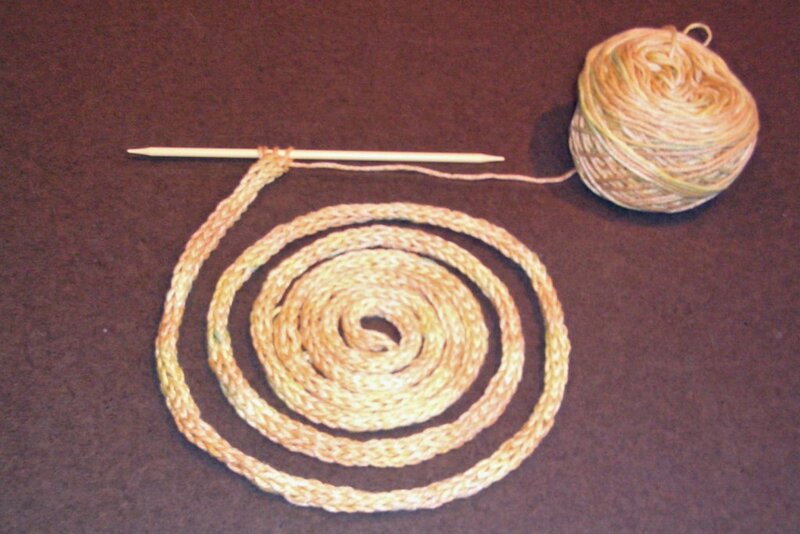 The two yarns on the right were wrapped in the same manner. 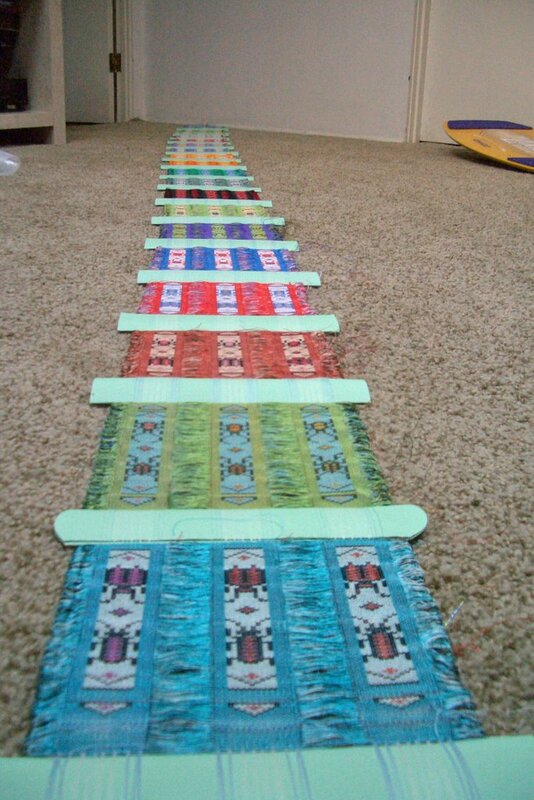 I put the plastic down without cutting it off the roll and laid the yarn across the shorter part. I folded over the plastic and laid the next section of yarn across and folded the plastic over again. This way the yarn was separated by plastic warp in all spots except the very ends. Once done, I wrapped the entire piece in plastic wrap so it would not drip. This method seemed to work well, use the least amount of plastic wrap and was easy to unwrap during the rinsing process. What I am going to try on Friday: I am going to try to dye one more skein on Friday following this process. However, I am going to try different things to avoid the tangles I got on the KnitPick yarn. I am going to use larger skeins so I probably will dye two or three balls at once. I am going to tie the skein in more places with yarn that is distinctively different that the knitting yarn so I can easily find the ties and remove the tangles. I am going to have larger spaces between colors to see how much the dye really wicks and check out how much mixing of colors occurs by the way the plastic wrap is used in method three. I am going to use the yellow yarn with a different color at each color change. If I have time I'd also like to try to dye one of those graduated color patterns too. Yes, in addition to my weaving yarn stash and my knitting yarn stash I have a thread stash. In fact the thread stash is larger than my knitting stash in both color selection and volume. Are you familiar with those plastic thread containers that hold hundreds of sulky threads? Well, I have two of the containers and they are both completely filled with colors. Plus I have an 'overflow' basket with more bobbins of thread. I always seems like the more choices you have in color...the tougher it becomes to create the 'right' combination. I recalled this morning I had written an article a year or so ago about my favorite color books which gave me an idea on how to proceed in color selection. I pulled out the book Living Colors...it was hidden under a pile of other books. I had forgotten it was one of my favorite books - out of site out of mind. I am going to select 'palettes from history' for my remaining bookmarks. I will let you know later as to what I select. But for your reading pleasure here is the book review I wrote for our local weaving guild's newsletter awhile ago. It provides more details about the book. Having jus re- read it, I realize I have progressed quite a bit in my ability to select good combinations of colors since I wrote that article. But I still find it easier to design the structure than select the colors, so I still must be a structure person. 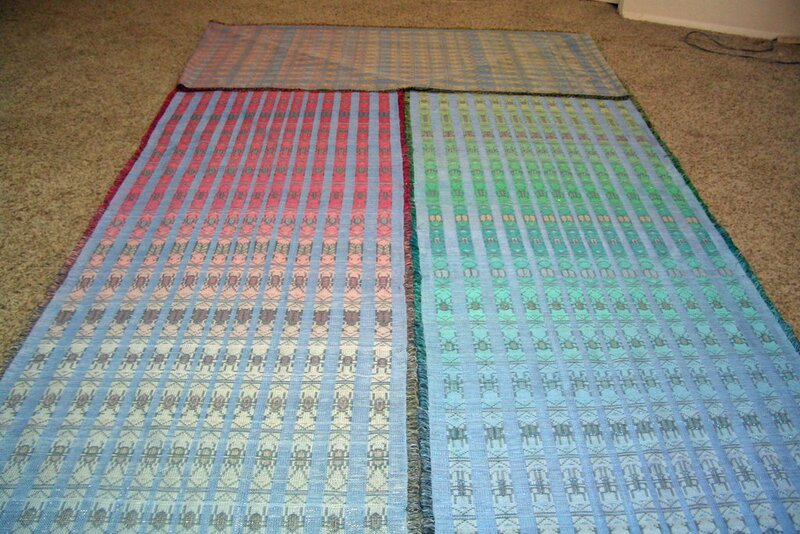 I have always heard that there are two types of weavers; color and structure. The color weavers are those who can easily select yarn combinations that speak volumes to their audience. Their colors blend, sizzle or harmonize at their command. But that's just not me. I am a structure person. I get quite stumped when I need to choose yarns. I have a whole queue of designs just waiting to be woven if only I could find the right color combination from my stash. If you are like me, often struggling with color, then these books might be for you. This is my first suggestion. 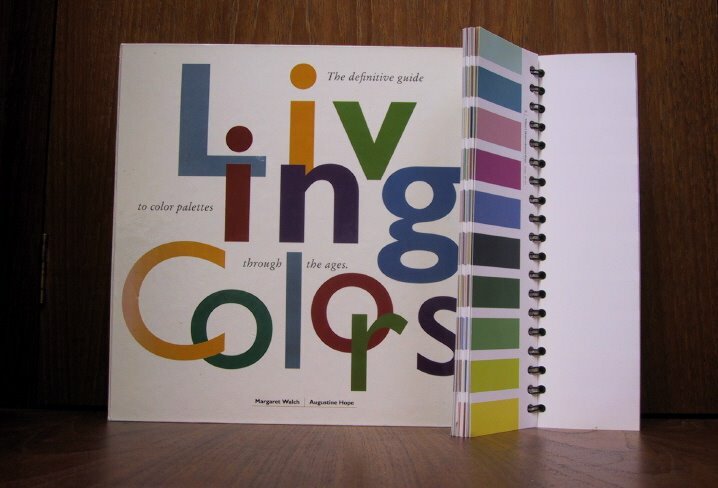 Living Colors; The definitive guide to color palettes through the ages by Margaret Walch and Augustine Hope, 1995. Available from the LA Public Library. 5-10 color chips on each palette. Examples of palettes include those of famous artists like Matisse, Albers, Whistler, Seurat and many more, by historical periods like The Twenties, or Thirties, by place like Egypt, the Southwest, Japan, SoHo and Hawaii plus palettes representing Tiffany, Liberty, Wedgwood & Bakelite and other niches of history. 1. I periodically flip through Living Colors and put stickers on those palettes I find attractive or appealing. 2. Later, I match the yarn in my stash with the colors of the palette, cutting a piece of yarn from each color and attaching them to a key ring that I have labeled with the palette's name. 3. I keep all the key rings on my bulletin board for inspiration. 4. When a loom becomes available to turn one of my doodles into a woven piece; I take a look at my key rings of palettes and select one; knowing the colors will work well together. Often I will use the same palette for a series of pieces; this frees me from the ongoing worries of color and leaves me more time to focus on design, technique, contemplation and the joys of weaving. Here is one more book to consider. Color Harmony Workbook; a workbook and guide to creative color combinations from Rockport Publishers, 2001. Easily available from Amazon.com and other places. color combinations to achieve these moods. For each mood, there are small color chips that can be torn out of the book and used like swatches. With 60 swatches for each mood,there are more than enough color combinations to mix and match with the yarns in my stash to achieve the desired effect. Both books have provided a good starting point for color selection in my weavings; Color Harmony to achieve the right mood, and Living Colors to achieve a pleasing palette. If you are not satisfied with your color selections, these books may provide a new perspective to take your weavings to the next level. " This is my yarn man. He is wearing my entire weaving stash. My entire weaving stash is here - - a small piece of every type and color of yarn organized onto lots of different key rings. Some key rings represent what is in each box in the back closet - they are organized by color. Others represent yarns I have put together for some reason...all my Navajo yarn is on one ring...yarns from various tapestries I have done are on individual rings...yarns of similar types are on similar rings...lots of permutations...lots of yarn. I find organizing my stash by this method extremely useful. I don't have to go into the closet, take down various boxes and dig through them in search of the perfect yarn. 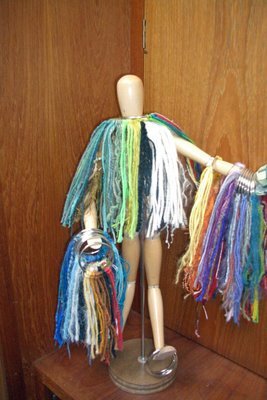 This way I just disrobe my yarn man and check out all the various yarns on the key chains he is wearing. If I want a specific yarn...I can then go to the one box where it is stored. I just realized there is actually more yarn in my weaving stash...for the yarn I hand dyed, I do something different. I couldn't find my Economist last night so I picked up Stephanie Pearl-McPhee's new book Knitting Rules to read prior to going to sleep. Two hours later, I finished the book for the third time. What a hoot! I definitely recommend it to all knitters for some light reading to make you smile. And a warning for non-knitters: this book is not recommended for the non-knitters of the world [85% of the population]...you simply will not get it. Do note however, you don't need to have been knitting long to 'get it'...I have been knitting since the Olympics...I got it. If you're a non-knitter but have a whole lot of knitter friends...you may get it. Try knitting first...then you will definately get it. Why was I a non-knitter for fifty years? The five reasons given on page 13 really don't fit for me. I avoiding knitting to avoid being obsessed by knitting. 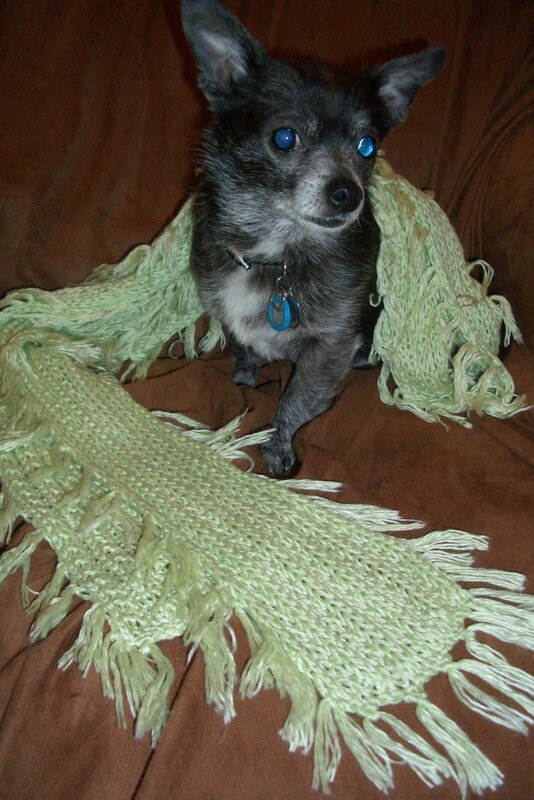 If I was obsessed by knitting how could I weave? I figure one can only be obsessed by one thing at a time. I was a bit nervous taking the 'what is your level of knitting obsession' quiz. But I felt content with the results. * I gauge...others do and some do not. *And as for sweaters I think I'll avoid that knitting 'black hole phenomenon'...for now. WARNING TO WEAVERS: Do not idlely ask the question "Which is better straight or circular needles?" to a group of knitters. Expect a response similar to this question asked of a group of weavers "What is the better way to warp - front to back or back to front." Either way - the noise is deafening. Between the rain and taxes not much progress on my tapestry. It is way too dark to weave in the front studio. The back studio is OK since I have better lighting there. 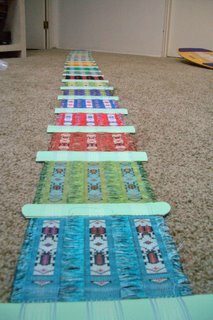 I was able to finish another bookmark...that's the 13th...seven more beetle patterns to go. And it was another good day with the postal service...they delivered my yarn for dye day from KnitPicks. I got a bunch of balls of cream and some of butter. Now I need to plan out what I am going to dye. If you don't remember our upcoming Dye Day...read here. I asked for suggestions for an upcoming self patterning yarn dye day on a couple dyers lists. Here are some suggestions. 1. Soak your fiber in the soda ash solution & let dry. Then make your 40 ft skeins. Otherwise it will be way too messy. 2. Keep the cats [or in my case the chihuahuas] away when balling up the completed dyed yarn. Remember its' a 40 ft skein so it will go around lots of furniture and you'll get lots of exercise walking around with the ball winder. 4. Tie the skeins in lots of places...otherwise they will become a tangled mess. 5. 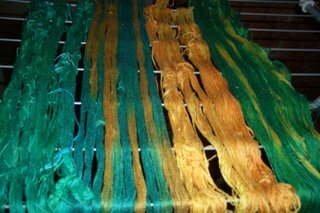 Make sure the dye goes all the way through from top to bottom when the skein is painted. PS. I discovered a three inch loop in my scarf this morning...turns out when playing with the chi's yesterday a dog nail got caught in the scarf. After five minutes of massaging with a tapesty needle all is fine. Perhaps this is a reason I don't want to knit a sweater. I could see me spending months knitting the sweater then fixing it everytime I played with the dogs. You might suggest "don't play with the dogs". Don't be silly - anther suggestion might be - don't knit the sweater! On my celestial tapestry on the big Shannock I am [still] working the black section above the hem on the bottom. Once this is done, it will become a lot more fun as I get to be creative with all the blending. It's a bit hard to remain patient and keep working the black. I am working five butterflies across in order to provide a good base for the rest of the weaving which makes it slower than simply going all the way across. I am almost at the point when I can start to worry about getting a good curve. And hence I am wondering how tight to make the warp. This loom has the ability to make the warp really really really tight. I am just not sure how tight it should be. 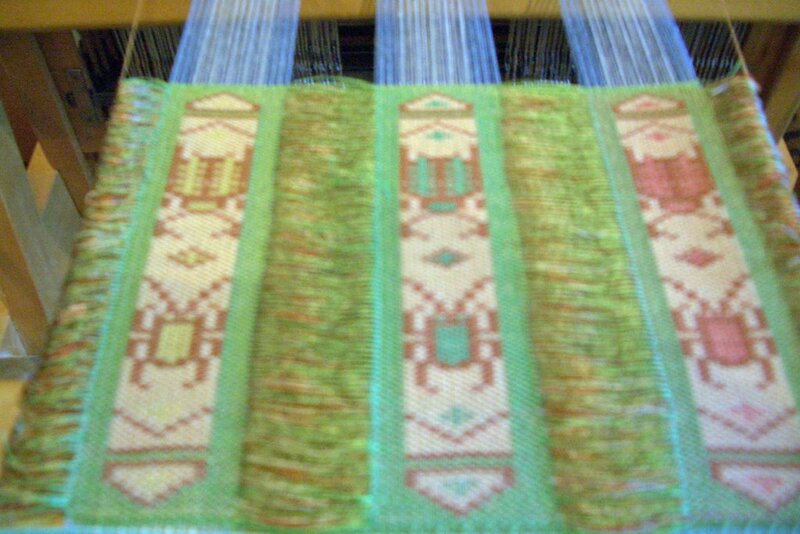 The tighter I make it the more potential distortion I will have when the piece comes off the loom. This is actually a double whammy question since I am using a new loom and a warp that I have never used before. Perhaps a good question for the 'tapestry collective'. Perhaps I'll put the question to the tapestry list. My 'bug' yardage is hanging next to my big Shannock. I am quite excited it is straightening out. 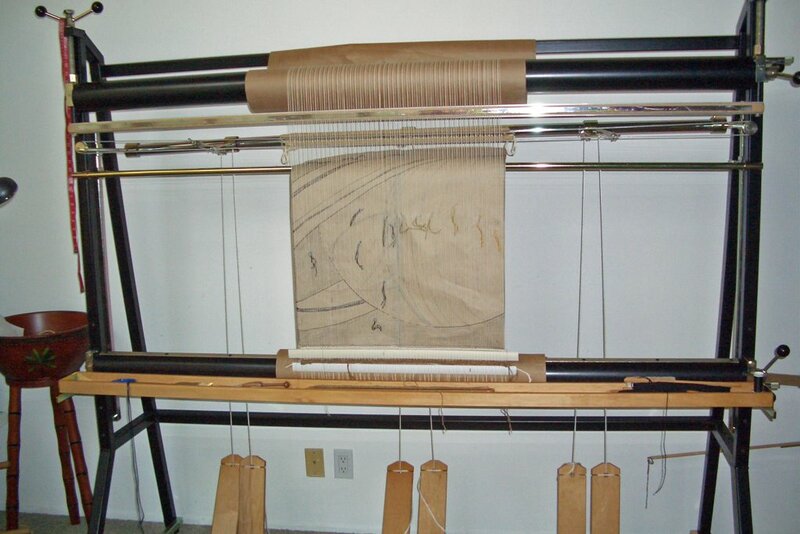 When I hung it the first time it was real cockeyed because my warp tension was not uniform during the weaving process. I have been tweaking the piece for the last six weeks or so to see if I can get it to straighten out a bit. In retrospect I wish I had not put the straight lines separating each row of beetles. Those straight lines accentuate the problem. 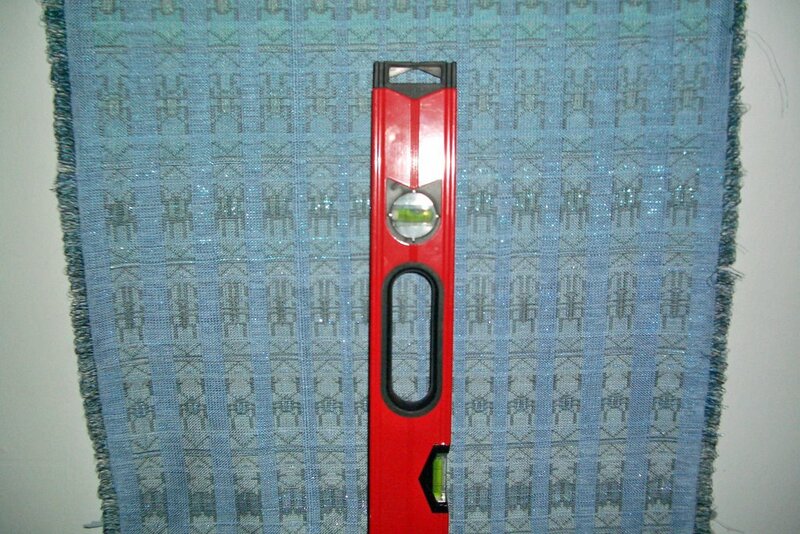 I keep checking with my favorite weaving tool to see if those lines are becoming more horizontal. Yes sir yee...they are straightening out. Whoopee! Books, books, books what books am I reading? Before going to sleep last night, I read the Yarn Harlot's latest book. I always read her blog and she was instrumental in getting me through my knitting sampler with that insidious Knitting Olympics. For those reasons, I figured why not buy her new book and give it a read. I am going to re-read it again and will provide some insightful nuggets about knitting and me. I also got Knitting over the Edge by Nicky Epstein. It is billed as the second "essential" collection of over 350 decorative borders. Included are unique ribs, cords [I do so like I-cords], appliques, colors and nouveau. Knitting over the Edge has a similar format to her other book which I liked. I am putting both on my Christmas list for my DOH. [Perhaps he'll just hit the link to Amazon and order them now!] As I was flipping through the book, my eye caught a picture of knitted closed circles which gave me a great idea for a woven sculpture in metal. Off to OSH I went to gather some metal supplies. Now I can work through this new idea as I wait for one of my looms to become free. This is why I like her books...not exactly for the knitting ideas...but for the cross over effect.